According to British Orienteering rules, every orienteering event must have a written risk assessment. It is the Organiser's duty to prepare the risk assessment. The Controller must check and sign the risk assessment. So if the Controller is not happy with the arrangements then changes have to be made before the risk assessment can be signed off. 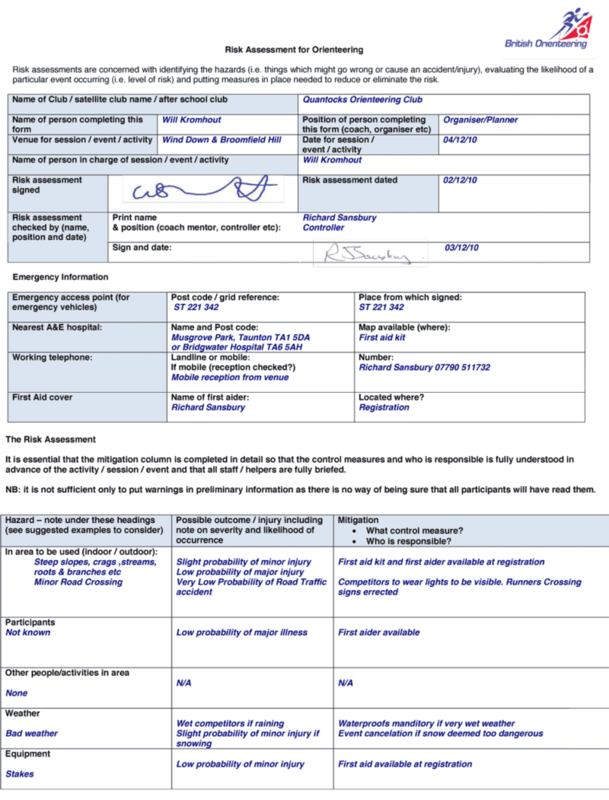 It is recommended that Organisers use the latest standard British Orienteering risk assessment form, which can be downloaded here. It is much better than previous versions. Examples of filled in risk assessment forms can be found below. Why is risk assessment required? Risk assessment is a normal part of most sports. It is not possible to eliminate all risk, so accidents may still happen. Written risk assessments are highly likely to be referred to in the event of any claim or inquiry. A written risk assessment will be very important in defending the club and its officials. This is usually the biggest risk. It is a very bad idea for junior courses (i.e. white, yellow and probably orange) to cross traffic. Adult courses should be ok, providing the crossing point is in a reasonably safe place to cross. Additional controls are often placed near road crossings to force competitors to cross in a safe place. Do courses cross the parking area or the access road? If the answer to either the above is yes, then find out exactly where. Safety can be enhanced by a road crossing marshal. But note the marshal can only act as a look-out for runners, they have no authority to try to control traffic on a public road. If you are not happy with the arrangements, make the planner change the course designs. Ideally we would have a qualified first aider on hand at all times, but with limited people available this is rarely possible. Refer to the QO first aid policy. Extreme weather can be a danger, particularly in mid-winter. Occasionally event organisers require competitors to wear or carry waterproof cagoules, but that is only common on long distance events. However, the biggest danger from the weather may be the effect on road safety for people driving to the event. Consider cancellation if the roads are not safe.